Three members of a family in Lodhoma under Darjeeling sub-division were killed this morning after their house got swept away by flowing debris triggered by a landslide. Another family escaped by a whisker but their property got destroyed completely in the incident that occurred in the wee hours. 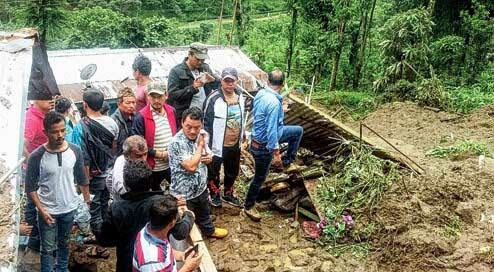 The mishap brought back memories of the grim tragedy at Tingling in Mirik a year ago when 19 people of Limbu Gaon were killed by a landslide triggered by more than 48 hours of incessant rainfall. The death toll in today’s landslide may have been lower, but like the Tingling incident, the houses of the two families at Fenchaytar Village in Gairigaon under Lodhoma GP were located on a steep slope, aggravating the damage. The Darjeeling district administration confirmed the deaths and said help and relief materials had been arranged. “Three persons died in a landslide that occurred at Fenchaytar village at four this morning. Their bodies were recovered around 5.30am and sent immediately for post-mortem to the Darjeeling district hospital. Relief materials to another family residing in the area, whose house was damaged, have been provided and they have been shifted to a relief centre nearby,” said Darjeeling district magistrate Anurag Srivastava. The bodies of Mann Kumar Limbu (33), a daily wage earner, his wife Premkit (25), and son Anish (8) were recovered from under a huge pile of debris. Prima facie, it appears the three were sleeping when the killer debris covered the house and swept it away with tremendous force. Lok Bahadur Limbu and his family who live nearby miraculously escaped death even though half of his house was damaged by the landslide. Lok Bahadur had gone out to drink tea while his father and son were sleeping in the room that was not touched by the landslide. “Call it luck or God’s will, but Lok Bahadur and his family escaped sure death. He was outside the house while his son and father were in another room,” Dipen said. Gorkhaland Territorial Administration chief executive and Gorkha Janmukti Morcha president Bimal Gurung reached Fenchaytar village to interact with the affected and took stock of the situation. “Our party president visited the area and talked to the affected. The GTA is planning to build a house for Lok Bahadur and relief materials have been provided to them. They will be shifted to a relief camp at the local community hall,” said Prakash Gurung, the GTA Sabahsad of the area. Three members of a family in Lodhoma under Darjeeling sub-division were killed this morning after their house got swept away by flowing debris triggered by a landslide.